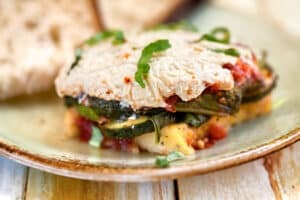 This easy baked polenta casserole uses prepared polenta (the kind that comes in a tube) layered with zucchini and spinach. Smothered in marinara sauce and topped with melty vegan cheese, it’s almost so embarrassingly easy to make, but such a crowd-pleaser. Use a really flavorful prepared marinara?roasted tomato, garlic, mushroom, or chunky vegetable. Adapted from Vegan Express […] The post Baked Polenta Casserole with Zucchini & Spinach appeared first on VegKitchen.